Are you an Instagram lover like us? If you haven’t ventured into the world of Instagram you should certainly consider it – it’s super easy and tons of fun! Unfamiliar? Instagram is a photo-sharing app you use on your smart phone that creates Polaroid style-photographs. It allows users to upload a photo, add a filter, and share with their friends. It also links up to Facebook, Twitter, and Tumblr should you feel so inclined to share there too. First, follow @berninausa! (Simple!) You can search for users by opening up the explore window from your main screen. This is your home screen. From here you can upload a photo, search for a user, search for a hashtag, and see photos tagged with your hashtag. Select the icon circled in red to see photos tagged with your hashtag. Use the explore function – star icon – to search for users and hashtags. Select the “heart search” icon to see who has liked or commented on your photos, or if someone has started following you. Also – if a user tags you in a photo you’ll get a notification here. 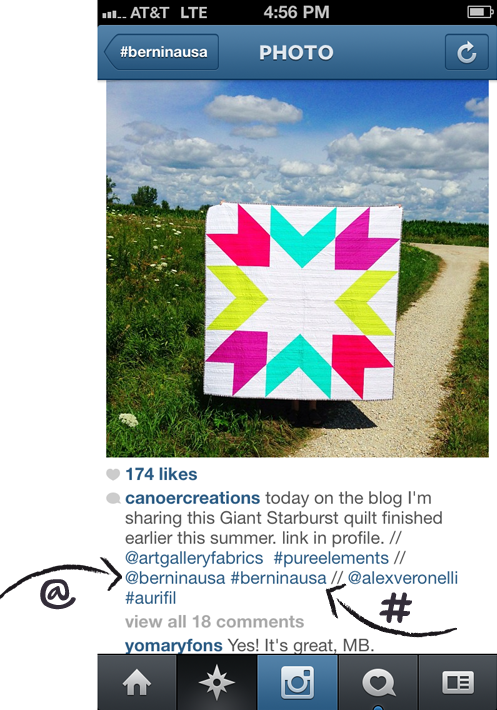 Second, upload your sewing, quilting, and crafting photos. Be sure to tag BERNINA by either “@ mentioning” @berninausa in your caption or tagging us in the photo by using the people icon. Adding the hashtag #berninausa will publish your photo in our community. Want to see what other sewists are working on? 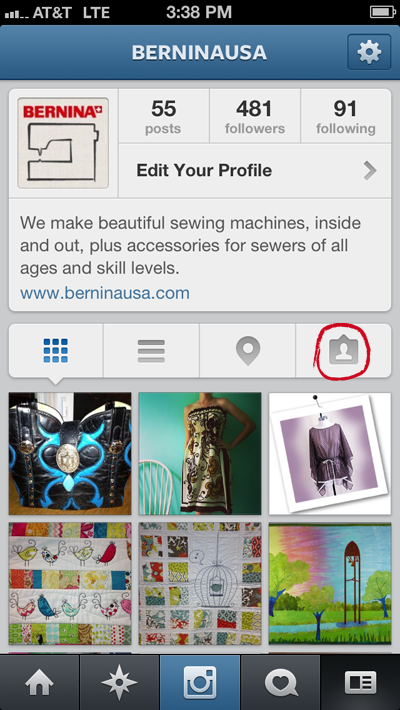 Just search #berninausa under your explore window or look under our people feed! “@ mentioning” is when you include an Instagram user’s name in your caption. This will send a notification to that using letting them know you’ve included them in an upload. Including #berninausa allows your photo to be published under the hashtag when searched. Now it is up to you to try it out. Have fun! Next Next post: No Thread Slot? No Problem!